The 1890 census was the first to be compiled using methods invented by Herman Hollerith and was overseen by Superintendents Robert P. Porter (1889–1893) and Carroll D. Wright (1893–1897). Data was entered on a machine readable medium, punched cards, and tabulated by machine. The net effect of the many changes from the 1880 census: the larger population, the number of data items to be collected, the Census Bureau headcount, the volume of scheduled publications, and the use of Hollerith's electromechanical tabulators, was to reduce the time required to process the census from eight years for the 1880 census to six years for the 1890 census. The total population of 62,947,714, the family, or rough, count, was announced after only six weeks of processing (punched cards were not used for this tabulation). The public reaction to this tabulation was disbelief, as it was widely believed that the "right answer" was at least 75,000,000. The United States census of 1890 showed a total of 248,253 Native Americans living in the United States, down from 400,764 Native Americans identified in the census of 1850. The 1890 census announced that the frontier region of the United States no longer existed, and that the Census Bureau would no longer track the westward migration of the U.S. population. Up to and including the 1880 census, the country had a frontier of settlement. By 1890, isolated bodies of settlement had broken into the unsettled area to the extent that there was hardly a frontier line. This prompted Frederick Jackson Turner to develop his Frontier Thesis. The original data for the 1890 Census is no longer available. Almost all the population schedules were damaged in a fire in the basement of the Commerce Building in Washington, D.C. in 1921. Some 25% of the materials were presumed destroyed and another 50% damaged by smoke and water (although the actual damage may have been closer to 15–25%). The damage to the records led to an outcry for a permanent National Archives. In December 1932, following standard federal record-keeping procedures, the Chief Clerk of the Bureau of the Census sent the Librarian of Congress a list of papers to be destroyed, including the original 1890 census schedules. The Librarian was asked by the Bureau to identify any records which should be retained for historical purposes, but the Librarian did not accept the census records. 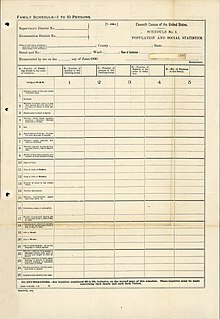 Congress authorized destruction of that list of records on February 21, 1933, and the surviving original 1890 census records were destroyed by government order by 1934 or 1935. The other censuses for which some information has been lost are the 1800 and 1810 enumerations. Few sets of microdata from the 1890 census survive, but aggregate data for small areas, together with compatible cartographic boundary files, can be downloaded from the National Historical Geographic Information System. ^ "Library Bibliography Bulletin 88, New York State Census Records, 1790-1925". New York State Library. October 1981. pp. 44 (p. 50 of PDF). Archived from the original on January 30, 2009. Retrieved December 15, 2008. ^ Austrian, Geoffrey D. (1982). Herman Hollerith: Forgotten Giant of Information Processing. New York: Columbia University Press. pp. 85–86. ISBN 0-231-05146-8. ^ Dippie, Brian W. (1982). The Vanishing American: White Attitudes and U.S. Indian Policy. Middleton, CT: Wesleyan University Press. p. ??. ISBN 0-8195-5056-6. The data yielded by this census provided strong evidence that the United States' policies towards Native Americans had had a significant impact on the enumeration of the census in the second half of the 19th century. US domestic policy combined with wars, genocide, famine, disease, a declining birthrate, and exogamy (with the children of biracial families declaring themselves to be white rather than Indian) accounted for the decrease in the enumeration of the census. Chalk, Frank; Jonassohn, Kurt (1990). The History and Sociology of Genocide: Analyses and Case Studies. New Haven: Yale University Press. ISBN 0-300-04446-1. ^ Turner, Frederick Jackson (1969). The Early Writings of Frederick Jackson Turner Compiled by Everett E. Edwards. Freeport, NY: Books for Libraries Press. ^ Blake, Kellee (Spring 1996). "First in the Path of the Firemen: The Fate of the 1890 Population Census, Part 1". Prologue Magazine. Washington, DC: National Archives and Records Administration. ISSN 0033-1031. OCLC 321015582. Retrieved April 13, 2013. ^ Blake, Kellee (Spring 1996). "First in the Path of the Firemen: The Fate of the 1890 Population Census, Part 3". Prologue Magazine. Washington, DC: National Archives and Records Administration. ISSN 0033-1031. OCLC 321015582. Retrieved April 13, 2013. ^ US Census Bureau, Census History Staff. "Availability of 1890 Census - History - U.S. Census Bureau". www.census.gov. Retrieved March 28, 2017.